OnSIP and RingCentral are big names in the world of business VoIP. But which provides the better product? We put the brands head to head to see who comes out on top. 8x8 and Nextiva are leading business VoIP providers, but which is right for your needs? We compare both providers' features and pricing to help you decide. With so many world-class business VoIP providers available, where should you place your custom? Which business VoIP provider really understands what a modem business needs? We compare RingCentral and Grasshopper. 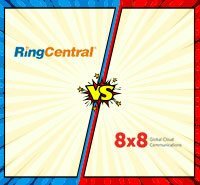 For businesses searching for a business VoIP provider, RingCentral and 8x8 are often at the top of companies' wish lists, so this battle between these 2 major providers will help you make that decision. There are so many good business VoIP providers for you to choose from. In this article, we're pitting two of America's heavyweights against each other. Who scores best for your business? It's Vonage Business VoIP versus RingCentral Business VoIP.